KABUL, Afghanistan—A roadside bomb killed a district police chief and his two bodyguards in a restive southern province in the second attack in as many days targeting local authorities in Afghanistan, police officials said Monday. 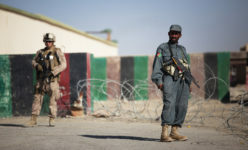 The roadside bomb in Helmand exploded as Mohammad Saifullah, the police chief in the province’s Garm Ser district, was driving by Sunday night, said Helmand provincial police chief Mohammad Hakim Angar. All three men were killed by the blast. 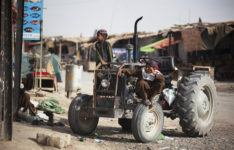 The province is one of Afghanistan’s most violent, and sits in the heart of the Taliban’s traditional stronghold in the south. GARMSIR DISTRICT, Helmand province, Afghanistan — Spread out within a maze of concertina wire and concrete barriers at Garmsir’s district center, Afghan National Police members partnered with Marines from 3rd Battalion, 3rd Marine Regiment to provide security for the funeral of District Chief of Police Lt. Col. Sayfullah Khan Rashidi here, Nov. 13. Sayfullah died after his vehicle was destroyed by an improvised explosive device that detonated as he was traveling on a Garmsir road, Nov. 6. Two other ANP members were killed in the explosion, which occurred on the first day of the three-day Islamic festival of sacrifice Eid al-Adha. 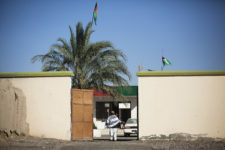 Following previous terms as chief of police in the Nawa and Gereshk districts, Sayfullah assumed his duties here, Sept. 15. His time spent in Garmsir was short, but his impact was felt throughout the district. Perched in the turrets of armored vehicles in the nearby bazaar, 3/3 Kilo Co. machine gunners vigilantly scanned streets surrounding the district center for suspicious activity. Members of the ANP halted and searched vehicles passing through nearby checkpoints to ensure local elders had the chance to properly mourn Sayfullah. Inside the compound, local elders sat together with the commanding officers of the 1st and 3rd Battalions, 3rd Marine Regiment — Lt. Cols. Sean Riordan and Matthew J. Palma – to honor the fallen police chief. A mullah, or local religious leader, memorialized Sayfullah by reading verses of the Qu’ran and offering prayers in his name. The attendees offered condolences to his family members and shared a meal of bread, chicken, rice and fresh fruit. Amidst the challenging circumstances, 25-year-old District Governor Mohammad Fahim said Garmsir’s stability remains unshaken by Sayfullah’s death. “Lt. Col. Sayfullah was brave and it’s unfortunate we lost him, but we still have security and stability in Garmsir — this hasn’t changed,” Fahim said. Editor’s note: 3rd Battalion, 3rd Marine Regiment, is currently assigned to Regimental Combat Team 5, 2nd Marine Division (Forward), which heads Task Force Leatherneck. The task force serves as the ground combat element of Regional Command (Southwest) and works in partnership with the Afghanistan National Security Forces and the Government of the Islamic Republic of Afghanistan to conduct counterinsurgency operations. The unit is dedicated to securing the Afghan people, defeating insurgent forces, and enabling the ANSF assumption of security responsibilities within its operations in order to support the expansion of stability, development and legitimate governance. Afghan National Policeman. FOB Delhi, Afghanistan. November 2011. The funeral of LtCol Sayfullah. FOB Delhi, Afghanistan. November 2011. Local Afghan boys. FOB Delhi, Afghanistan. November 2011.